Henri Matisse, Paris; (Ambroise Vollard [1867-1939], Paris); Charles Boyer; (E. Coe Kerr Gallery, New York); purchased by Mr. and Mrs. Paul Mellon, Upperville, VA, April 1969; gift to NGA, 1985. Exposition Retrospective, Salon des Independents, Paris, 24 March-30 April 1905, no. 30. "Van Gogh's Sheaves of Wheat", Dallas Museum of Art, 2006-2007, no. 26. Pickvance, Ronald. 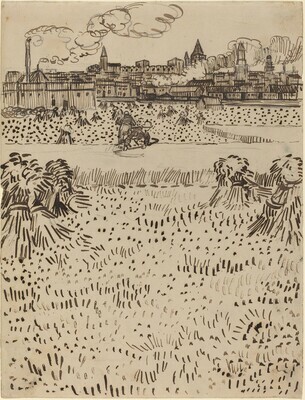 Van Gogh in Arles. Exh. cat. The Metropolitan Museum of Art, New York, 1984: 82. The Berggruen Collection, auction catalogue, Phillips, New York, 7 May 2001, under no. 44, p. 47, fig. 4.